A new type of bluegrass camp! Because Colorado January weather can be quite cold, especially at night, all camp activities will be held in heated indoor spaces in the Boulder Inn. Tuition: Tiered pricing (see below) as low as $300. Two-hour band coaching session with Pete, 4-6pm Tues. Wed. Thu. January 10, 11, or 12. $300. Write Pete for info or a reservation. 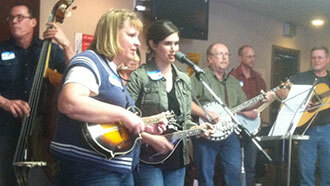 Limit of seven people in each of the main bluegrass instrument categories: Fiddle or dobro / guitar / banjo* / mandolin / bass. Same content and requirements as a typical Pete Wernick Jam Camp. You must be able to tune your instrument (electronic tuning devices welcome) and change smoothly between G, C, D, and A. Fast playing is not expected, nor is the ability to solo required. For organized bands Harmony singing, band cohesion, rehearsal guidance, stagecraft including working with sound systems, band decision-making, "how to make a band work". All members of the band (at least 4 people) must attend for the full week. Each band must be an ongoing performing band with 15+ paid performances/year. Short description of band and recording of 2+ songs should be sent with application. 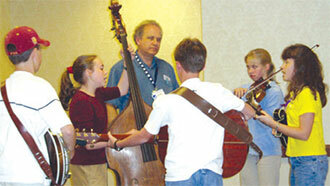 Partial bluegrass groups -- $450/person Groups of people who often play together and want to be coached together in a group. Need not be performers, may include novice players. Rate available only for people registering together. Individuals -- $600 These spots will filled as available, with preference given to people registering in groups. Waitlists for each instrument will be used to fill vacancies in partial groups. To get on waitlist, send completed application and deposit as directed on signup page. Groups will be completed by Dec. 1 and all applicants notified.